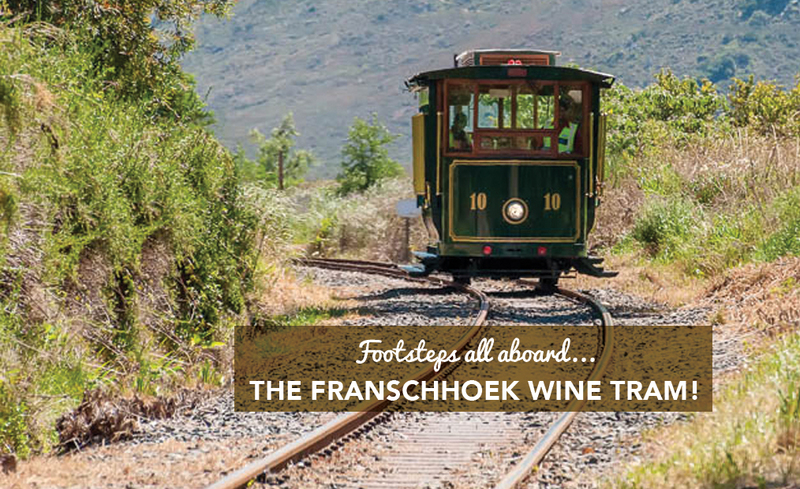 FOOTSTEPS ALL ABOARD…THE FRANSCHHOEK WINE TRAM! 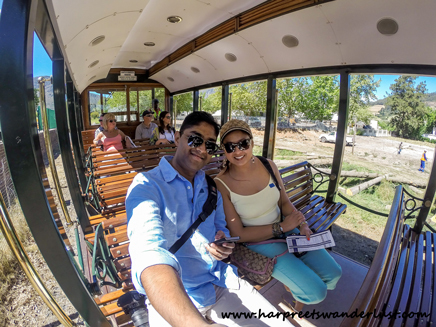 Budding oenophile and hopeless romantic that I am – I could not resist hopping on board the quaint Franschhoek Wine Tram to indulge in my wine venture! Now, hubby and I have done the Wines of the World course offered back in Nairobi, and ever since we did this we have wanted to put our ahem, “knowledge to the test”. What better way to test all those fancy sounding wine buzzwords like terroir, bouquet, nose (not the one on your face but rather the aroma wafting from the nectar in the glass!) and sip and swirl and stick your real nose in a glass than a wine tour? None that I can think of! 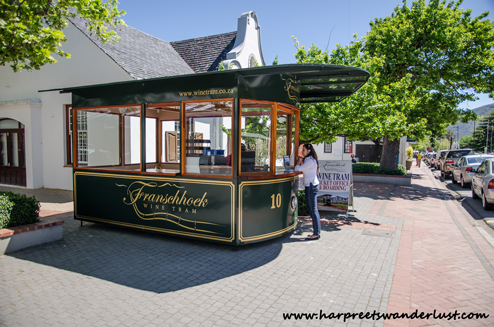 One of the key attractions in Franschhoek is this fantastic hop on, hop off tram/tram bus tour, which in my view is one of the best ways to visit wine estates and sample their wines and various fare offered, and immerse yourself in the whole wine experience. 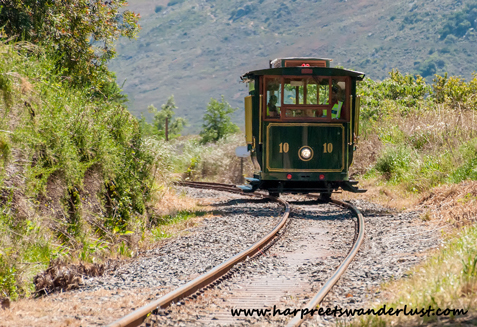 The tram hurtles its way through the Cape Winelands, on a tram track that was built in 1904 and today serves just the wine tram, stopping off at various wine estates on that route. The tram bus serves the wine estates that are not on the tram track line. Tickets are easy enough to buy – though space is limited and the first tram-bus/tram departs at 10:00 am on one of four routes – blue, yellow, red or green, so you need to choose what estates you want to go to. Being none the wiser and wanting to explore as many estates as we could, we chose the green and red lines both setting out at 10:00 am, which gave us 2 days of wine venturing. Perfect. All at the cost of 200 ZAR per person – and this includes 2 free wine tastings at select estates too! Day 1 – and I can’t help jumping like a kid in a candy store when I see the tram chugging its way down the tracks. A 10:00 am start means that we can try and visit 6 wine estates and of course – given that I am super ambitious and want to visit them all – I chalked the early drinking down to the fact that it must be cocktail time somewhere in the world – and hence the hour of the day didn’t stop us from imbibing and starting the wine venture from as early as 10:00 am! 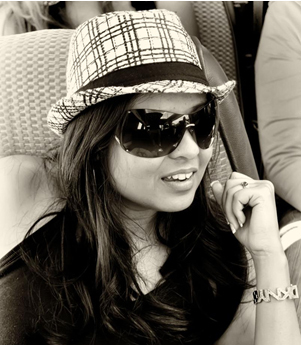 All on board – first stop ahead! 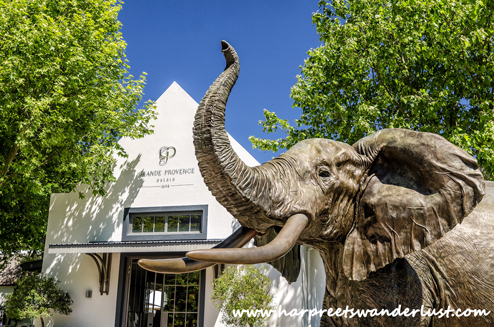 All aboard – the first adventure started at Grand Provence – no logic or research into why we chose this estate – I suppose we just liked the sound of the name! Upon arrival, I couldn’t feel more at home with the large elephant at the entrance, reminding me of the large bronze elephant at Nakumatt, our local supermarket back home! Grand Provence – somewhere in the world it is WineO’clock! A good place as any to put the philosophy that somewhere in the world it is 5 o’ clock and get those tastebuds activated – and put the wine knowledge to a test! I must say that it was fun choosing a tasting menu, sipping and swirling away, and pretending (yes, pretending being the key word here) to be a wine snob – but wine lingo aside, I soon discovered the kind of tastes I enjoy and wanted more of and those that I didn’t care for too much – so in a way, this wine venture was off to a good start! There are a couple of different tasting menus available so you can choose something that suits your tastes and – your pocket too. A couple of wine estates and many, many glasses of wine later – it was time for our picnic lunch. We had pre-booked this with La Couronne, and on arrival at the estate were presented with a lovely picnic hamper, some picnic blankets and a bottle of the good stuff, which we took down to a babbling brook and thoroughly enjoyed! How we managed to glug this down given all the tasting we had done – I still don’t know! 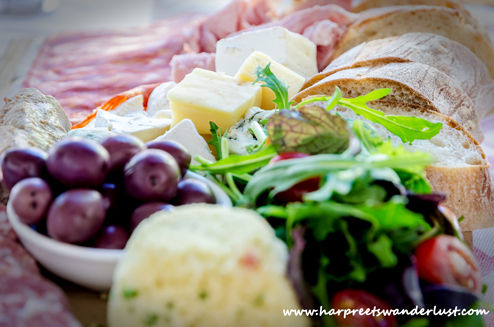 Indeed – a feast fit for a king – with a crusty fresh baguette, cold ham and salami, salad, olives – and a bottle of crisp Sauvignon Blanc, chilled to perfection! 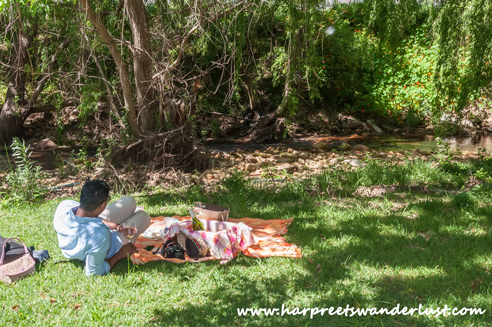 And of course – this being a trip of “firsts” – the first picnic for the hubster and I – he decided to indulge the hopeless romantic in me and play along with my whims and fancies…. …and just allow the drunken stupor to overcome him as I played around with the camera! Antics aside, you do get an hour to eat your picnic, though this means missing out on the tasting. Although, you would probably have visited a couple of vineyards by this point and ready for a spot of lunch before continuing on your wine venture. The highlight of the day (apart from my romantic picnic of course) – was doing an Olive Oil tasting – yes, you read right – Olive Oil!! La Bourgogne offers a unique tasting of two types of Olive Oil, all made on their farm, with some crusty bread and some fresh olives – at a very reasonable cost of 20 ZAR per person to complement the free wines that you get to taste, courtesy of the wine tram! 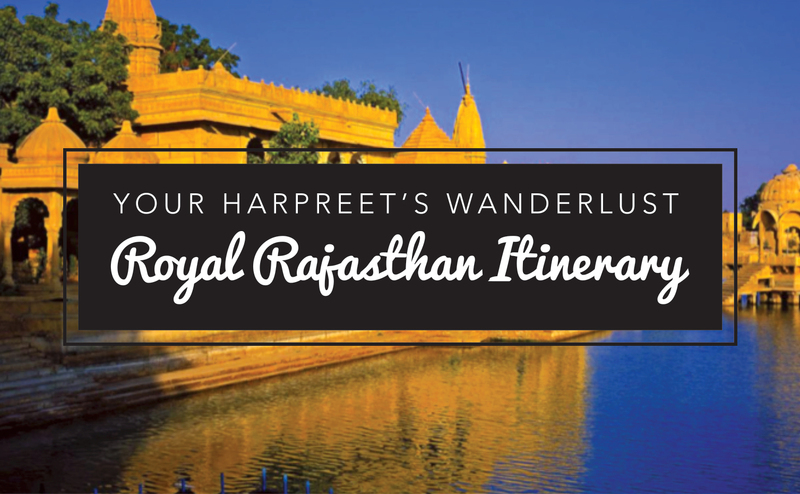 So, if you are into unique experiences – then this one is a must try. You will be surprised at the varying tastes of Olive Oil and will start to look at this greeny golden liquid as more than just oil to cook with or pour over your salads! Day 2 is red line day – where we explore international wineries, having had a good taste of the local boutique wineries on the green line the day before. I am quite excited to visit some of the wineries on this line – they all sound so fancy! La Bri, Chamonix, Dieu Donne, Leopards Leap, Maison, Eikehof! 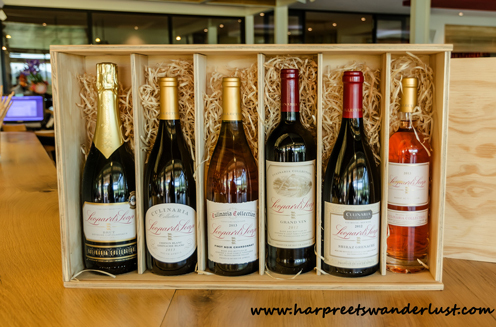 We get wines from Leopard’s Leap in Nairobi and so, that is top of my list for the day. I had read that the food and wine pairing at La Motte is to die for and wanted to try that but having left the wine venture bookings to the last minute, am grossly disappointed to find out that this is fully booked for the time we were in Franschhoek. 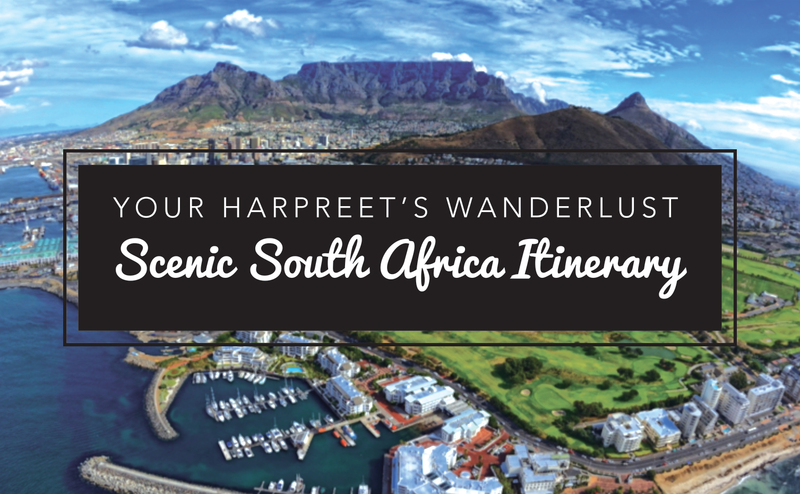 So a good tip for you my dear reader – is to do some research on where you would like to eat and try and book some of these places before you get to the Cape Winelands. Then maybe you can tell me about your experience! Now, you have heard of wine and olives, wine and cheese – but what about wine and chocolate? Perhaps one of my favourite tastings on this wine venture was the wine and chocolate pairing at La Bri. You get to try three types of chocolate, all dark Belgian handcrafted by the in house chocolatier and three fantastic red wines chosen to complement the taste of these chocolates. The combination really does make your taste buds sing with joy! Heaven, heaven! 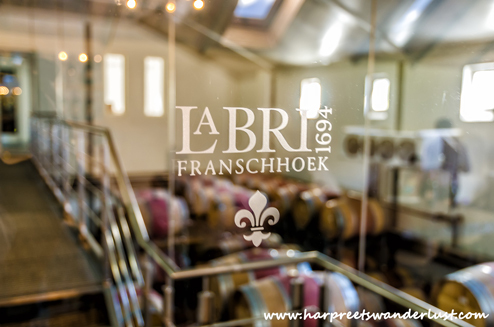 The wines at La Bri were so good that we chose to stay on for an extra hour and indulge in more of their wine with a biltong pairing – a true South African experience! I had mentioned to you that Leopard’s Leap was on my priority list for the day, and I was not disappointed with this visit at all. The tasting room is large and airy and lets so much light in, it is almost like sitting in a beautiful restaurant. 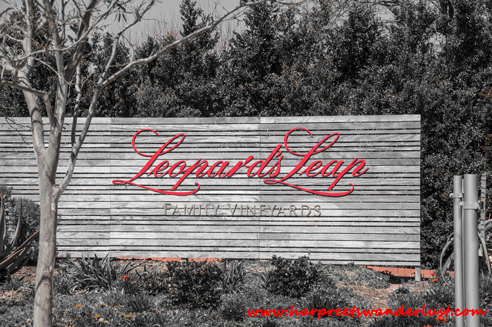 Leopard’s Leap is the answer to your prayers if you are “wined out” after 2 days of wine venturing, . 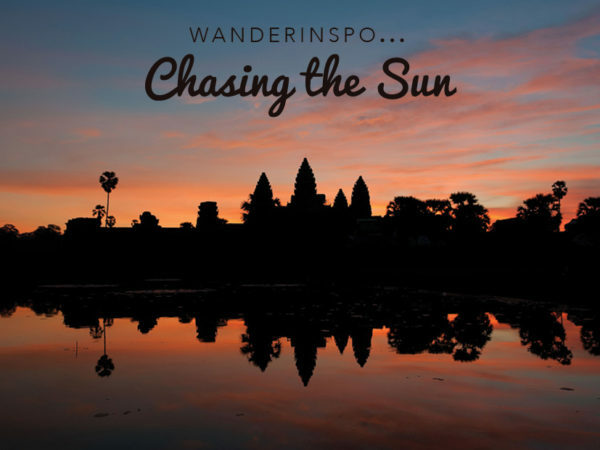 You can chill out on the terrace on the beautiful premises, in the warm African sun and enjoy the view, drink some more and indulge in their Rotisserie lunch (call to book and find out the days that they do this) or – take a cooking class! If we had more time in Franschhoek, I would have definitely signed up for a class and indulged my inner Julia Child. A pipe dream – for another day. 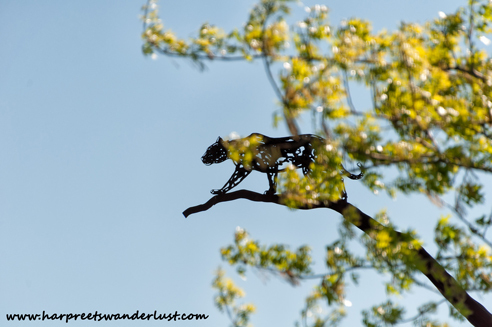 Loved this Leopard hiding in the trees! 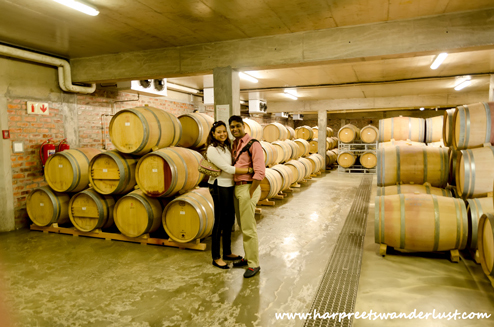 We did perambulate at this estate a while and enjoy some very exquisite wines – and I am pretty sad to say that some of the stuff that is exported to Kenya is not their best. 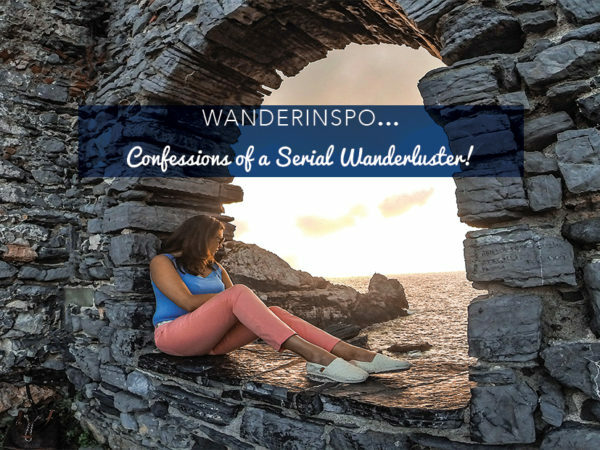 Which is a pity because by this point, after having checked off close to 8 wine estates and trying some really delicious wine -my taste buds were quite pampered and I have become accustomed to good wine! Final stops for red line day – the fantastic restaurant of Dieu Donne – which has the most beautiful panoramic view of the Cape Winelands, for a very late lunch (we spent a bit too much time at Leopards Leap and missed the kitchen times by a whisker) but the good folks at Dieu Donne indulged our whims and fancies and rustled up some delicious food for us, which by this point was very welcome! And of course, given that Chamonix was right next to Dieu Donne and the last stop for the day – we had to indulge in some bubbly here, and toast to a fantastic wine venture! Cheers to a fabulous wineventure! 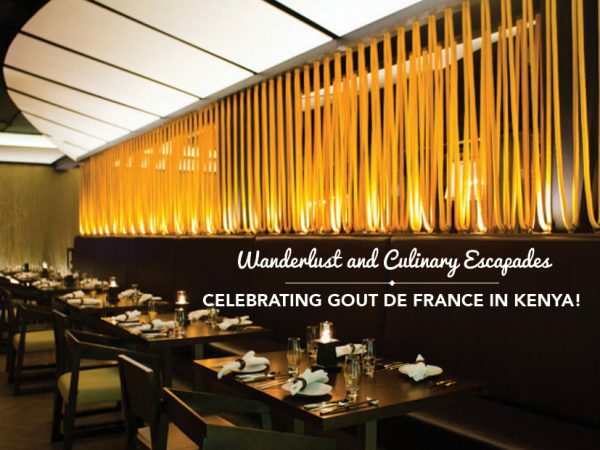 Wanderlust and Culinary Escapades – Celebrating Gout de France in Kenya!